There’s been a lot of talk about the goods and bads of various leaders post the May 2014 Elections..
We are trying to capture the views of all about which leadership style the most talked about leader of today Narendra Modi has. Following the Hay Group’s well researched 6 leadership styles, here’s a brief write-up about each of these styles and an opinion poll at the end about what style he predominantly carries.. So, here goes..
1. Coercive Leadership Style: Do it or else.. Leaders tell staff what to do and expect them to do it. They then check over their shoulders and are more likely to criticize what they are getting wrong rather than praise what they are doing right. 2. Pacesetting Leadership Style: Do it how I do it..
With the assumption that the most effective way to accomplish a complex task is to do it himself or herself, the pacesetting leader leads by modelling and is apprehensive about delegation. He expects the job to be done to the highest possible standard and has very little tolerance for poor performance. Poor performance leads to the responsibility being quickly taken away. 3. Coaching Leadership Style: Help people grow.. The coaching leader pushes each member of his team to be the best that he or she can be. He spends time with each one to understand his strengths and weaknesses and develop him to deliver his best. This leadership style has a long term focus, even at the expense of short term performance. This leader would delegate responsibility keeping in mind who can learn from it best and not necessarily based on who can do it best. 4. Democratic Leadership Style: Many brains are better than one.. He wants to get the best from his team by sharing decisions and responsibilities. Keen to achieve commitment and consensus, they involve everyone in the decision making process. They reward good team performance rather than any individual’s work. 5. Affiliative Leadership Style: Create Harmony.. The affiliative leader wants everyone to get along. He strives for harmony in the team by focusing on people rather than tasks. They trust that is they treat their employees well, they would be rewarded with loyalty and high performance. 6. Authoritative Leadership Style: Shape the vision.. He is focused on communicating the long term vision and purpose and ensuring that everyone os aligned to and motivated by ‘the big picture’. They win people over convincing them that they want to do the job. They give feedback to people about where they are vis-à-vis their goals and create a positive climate, People under them know what they need to do, why they need to do it and why their role is important. Training Gamification – To Play or not to Play? Games have been an inseparable part of human life. In early age, we learn mostly by playing. For children, games provide immense opportunities for social, personal, emotional as well as intellectual development. But is that true for adults as well? Do adults also learn by playing games or do they only prefer it as a recreational activity for enjoying leisure time? The growing popularity of various video games, on line games etc. point towards huge potential of gaming methodology for learning purposes. Not surprisingly, there is growing trend of using games in various forms in teaching and training interventions. There are numerous benefits of using gamed based method over traditional methods. 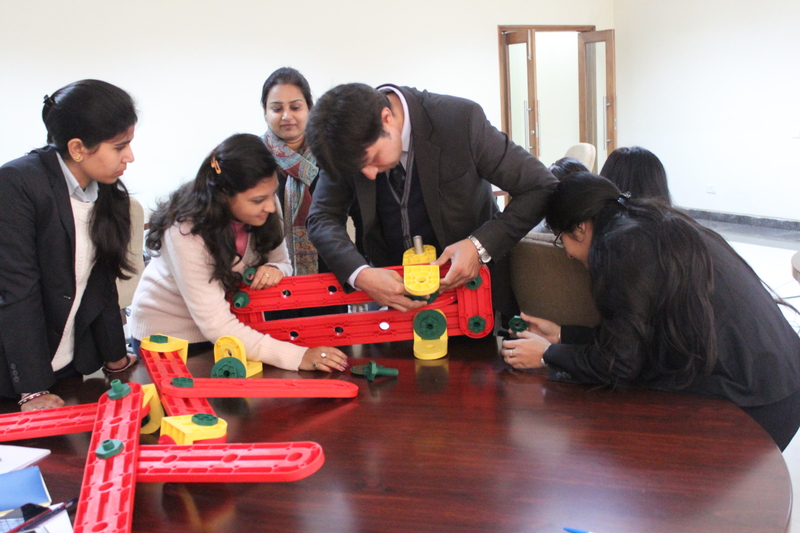 Game based methodology is fun, highly engaging, motivating and promotes self and peer learning. Even beyond these obvious advantages, the biggest support for this method of instruction can be attributed to the fact that they provide effective response to each level of Kirkpatrick evaluation for training effectiveness. Reaction – The first level of evaluation of training success is participant reaction to the program. Since game based methods offer high engagement and an outcome/ result at the end of the game basis participants’ performance, it ensures positive reaction from the same. Learning – The second level of evaluation assesses the extent to which participants have advanced their skills, knowledge and/ or attitude. A well designed game will assess skills gains by tracking the failures participants encounter during the game including the types and frequency of failure. For example if a participant fails to get past first stage couple of times but learns the skills and get past second stage in one attempt then skill gain is evident and learning is noted. Behaviour – The third level of Kirkpatrick model, Behaviour, attempts to measure transfer of learning to workplace which could be a tricky process. Any well designed game has behavioural aspect built into it which ensures high probability of learning application. Result – The fourth level of evaluation, Result, seeks to link the training with business outcomes. A simulation/ game is programmed to help participants see the impact of their actions on the business result hence enhancing the chances of improving the business outcomes post training. Relevance – Game should be designed keeping the learning objectives in mind so that the purpose of the workshop is fulfilled. 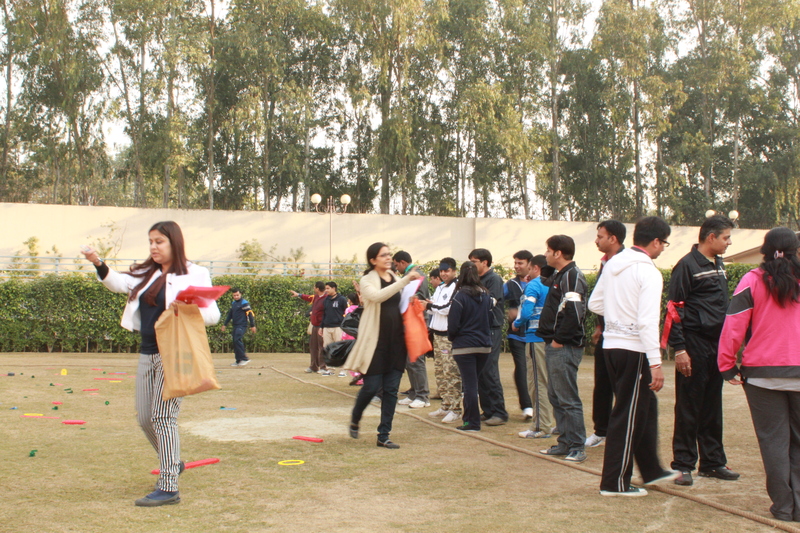 It is easy for the participants to get carried away by the ‘fun’ aspect of the game. Cost Effectiveness – Many times it becomes difficult for corporate to use it as a blended learning format due to high cost criteria. Choosing the appropriate gaming format which suits the budget is the key. Games are fun, engaging and multigenerational. Used in an appropriate way, they augment existing learning programs and enhance learner adoption, retention, application and business impact. Through the “Play for Performance” series we will be bringing to you the various experiential based learning tools which are increasingly being used today by corporates and academics alike to bring their training programs alive. Given that 70% of an individual’s learning happens through experience there is little doubt of the relevance of using game based learning tools in delivering training programs for creating long term and sustainable impact. 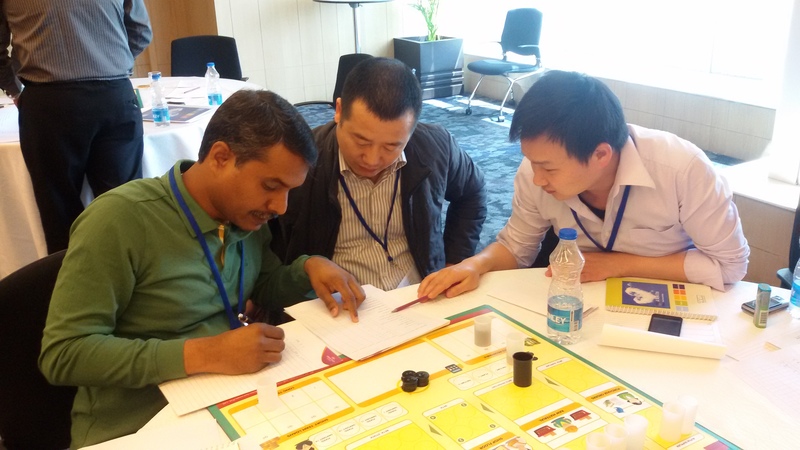 In this article we will explore the concept of Outbound trainings and board game based trainings. Board games have been played for thousands of years in all human cultures. They are a source of fun, social interaction, as well as amateur and professional competition. However, the use of board games as a focused and specific tool for developing thinking and other skills is a recent and less known practice. Board games are an important tool to provide hands-on and heads-on skill and knowledge development for people of all ages on all subjects. Not only do well-designed games create an engaging atmosphere, they also provide a non-threatening, playful, yet competitive environment in which to focus on content and reinforce and apply learning. Mistakes are useful and point out what we need to learn. The board itself provides a visual metaphor to help connect information. Game elements, discussions, and problem solving with fellow team members about the content are vehicles for learning. Subtle redundancy to reinforce learning and insure retention should be incorporated into the game design. Good questions, problems to solve, and situations to consider allow players to think through and apply what they learn. Effective games serve to organize information in a conceptual framework and to make it concrete. They provide analogies and metaphors to link new information. When played in teams, members learn together; no one ever feels singled out for not knowing an answer. They are played in teams to promote collaboration and diversity. They have an ending or time limit that can be achieved within a short time frame.
. In addition to enhancing critical thinking, team-based board games help to build communication and relationship skills as players work face-to-face to answer questions or solve problems and see that together they often figure out something they thought they didn’t know. The power of collaboration becomes apparent to all and, in organizational settings, can transform working relationships. When it comes to board games designed for educating, Play for Performanceis not an empty slogan – it is a fact! What Managers Can Learn from my 6-year old! My 6-year-old is into crafts these days. Most of the day you’d find him bent down frowning over some craft material with scissors or a tube of glue in his hand. Lately, however, he has become quite experimentative. He has graduated beyond the run-of-the-mill craft stuff that I get for him and moved on to try out different fabrics/ papers etc which he can lay his hands on. He tries things on anything that is accessible (bear in mind that he is never reckless – he’s never laid his hands on expensive curtain fabrics or beads from the puja room! )– not always asking for permission, knowing very well that he is risking my displeasure. But he also knows well that if he does end up creating something nice, he will earn a lot of praise and my displeasure will dissolve immediately. You know the expression, “it’s easier to get forgiveness than permission.” Well, it’s true. And watching my son, I have learnt an important managerial lesson. Good managers don’t wait for official blessing to try things out. They’re prudent, not reckless. But they also realize a fact of life in most organizations: if you ask enough people for permission, you’ll inevitably come up against someone who believes his job is to say “no.” So the moral is, don’t ask. Less effective middle managers endorsed the sentiment, “If I haven’t explicitly been told ‘yes,’ I can’t do it,” whereas the good ones believed, “If I haven’t explicitly been told ‘no,’ I can.” There’s a world of difference between these two points of view. Smart managers are risk taking but also politically savvy (just like smart kids!). They know how much they can stretch the organization’s resources to try something that holds the promise of being worthwhile. They are ‘organizationally aware’ – they know which power centers to turn to for additional resources if needed and which power centers to ‘keep in the loop’. This is an important skill that is definitely not taught in B-School but maybe an important success factor.